Britain's Olympic dressage champion Charlotte Dujardin followed Saturday's Grand Prix win with victory in the World Cup final in Lyon on Sunday. The 28-year-old and her London 2012 horse Valegro took the Freestyle class with a new floor-plan routine and music that scored 92.179%. Germany's Helen Langehanenberg finished second with 87.339%, and Dutch rider Edward Gal third on 83.696%. Dujardin is now the Olympic, European and World Cup champion. "I am absolutely over the moon," she said. "Winning the Grand Prix and Freestyle at my first World Cup final is just absolutely fantastic. It was so much fun in the arena. "He (Valegro) gives me so much and that's all you can ask for. It is just fantastic to be able to have him. It's all a dream come true. "Now that I've done this music once, hopefully it can only get better and I think this one could actually beat my Olympic music." 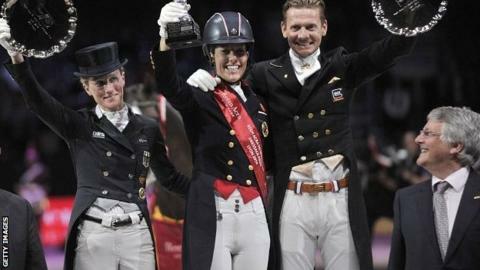 Gloucestershire-based Dujardin will next target the World Equestrian Games in late August.